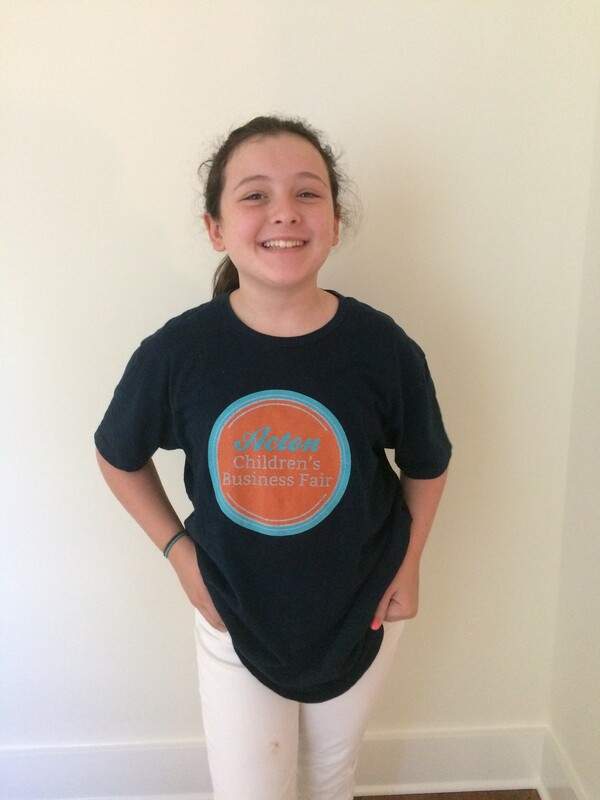 Every year, we host a community craft event called the Summer Craft Party! We open up our studio for the day so everyone in our community can come by and enjoy a complimentary D.I.Y. craft project. Our first year, we hosted over 50 guests creating painted canvas pouches, and last year we had a really fun plant shelfie project. 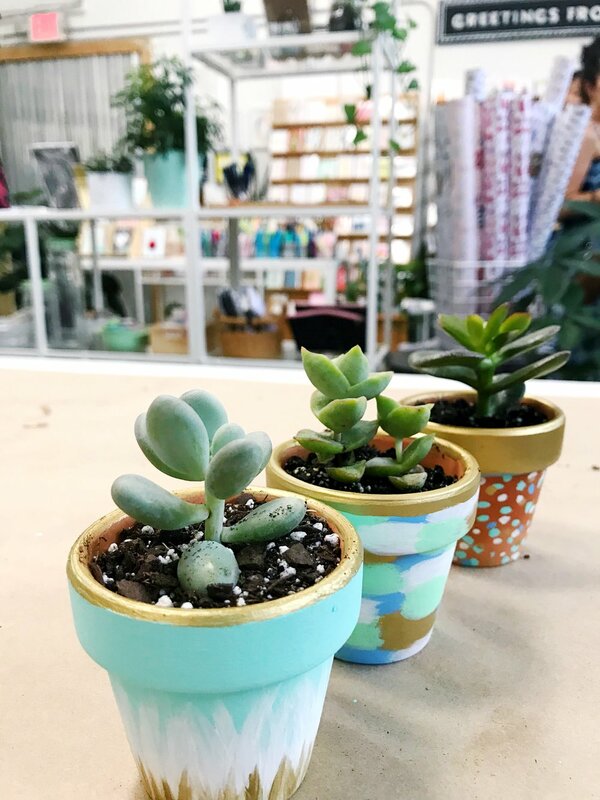 In keeping with the plant theme (because you know we love our plants :) we kept it fun + simple with painted mini planters! We had SO much fun getting to meet new guests in our shop as well as get to see so many familiar faces. We also decided to host a little plant adoption event like we did over Earth Day where a portion of all our plant "adoption" fees went towards a local non-profit chapter in town. 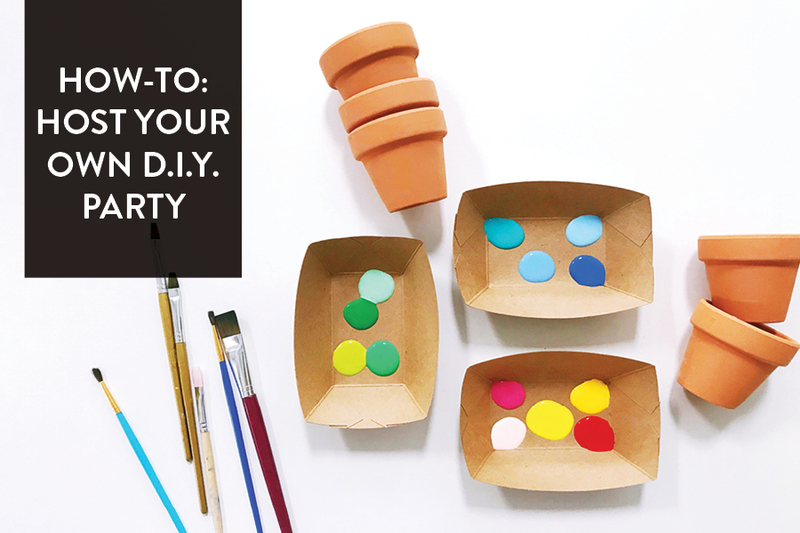 Word on the street is that a lot of y'all were a little bummed to miss out on our Summer Craft Party this year so we whipped up some simple instructions so you can host your very own Summer Craft Party for your friends + family! Just grab a few supplies you probably already have lying around at home, invite your friends and family for an afternoon of crafting fun. 1. Choose your color palette! We suggest starting with a few colors that go well together. *Pro-tip: we used recyclable trays for easy clean up! 2. Use your paint brush and create your master piece on the terra cotta pots! Use light and thin paint layers when you paint, you can always add more paint as you go. 3. Allow your pots to dry for at least 10-15 minutes. 4. Pick your new succulent friend and pot it in it's new home. 5. Find the perfect place to put your beautiful new pot + plant! In case you missed it, we read The Little Book of Hygge back in November for our studio's book club. It was THAT good we are actually reading his second book The Little Book of Lykke for our first book club meeting of the year that's happening this month! For those of you who may not know what Hygge is, we thought it was a funky name for a piece of Ikea furniture at first too! Hygge is pronounced "hoo-ga" and has been defined as "coziness of the soul", "taking pleasure from the presence of soothing things", and "cozy togetherness". 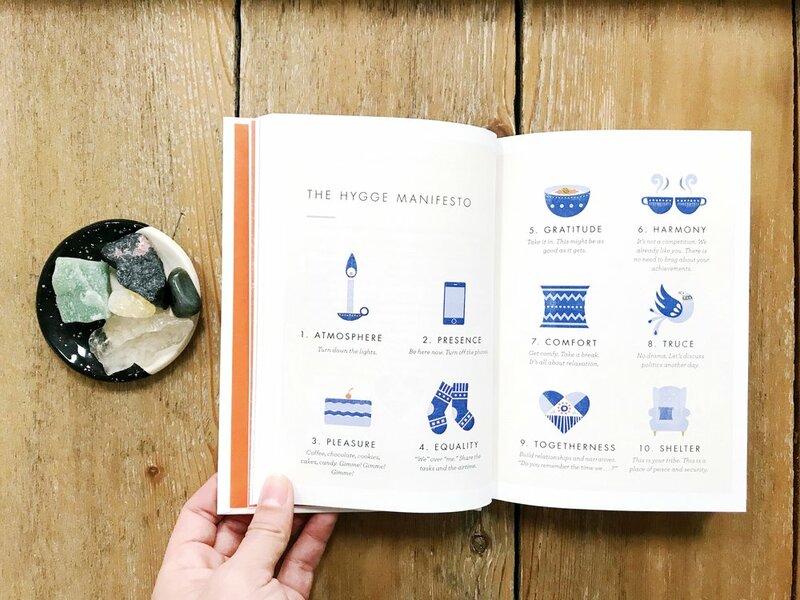 In a world that glorifies busyness, and where everything happens so fast, the idea of Hygge really struck a cord with us and we were intrigued with how we could apply some Hygge to not only our personal life, but to add some hygge for your business as well. We're sharing some of our best practices for incorporating this feeling of cozy into our every day both at home and at work. And we're also sharing a fun collaboration we worked on that is inspired by this whole idea of hygge below! The number one thing you need to create that feeling of hygge. Instead of saving that coveted candle you were gifted, indulge and light it (and enjoy)! Channel all things cozy, your favorite blanket, a mug of your favorite tea, that handmade bud vase from a local maker, this spot can become your refuge! We love that the Danes are so great at not letting an association of guilt accompany a little indulgence. Keep a bar of your favorite chocolate in your pantry and enjoy a piece when you want! Noticing a trend here? During the weekends and during workshops we keep a candle burning. A combination of fresh flowers, fresh candle and essential oil mist keeps our shop + studio smelling cozy and inviting! We want guests in our shop to feel comfortable slowing down when they come in our door. Giving them the space and time to browse through our shelves while taking a moment for themselves! We encourage folks to take their time to find that perfect card, or to pick out that special gift their looking for. We treat our brick and mortar like it's our home! When someone walks in the door, they're not a customer but rather a guest in our "home". We love genuinely connecting with our community that comes in and truly love that first timers always become regulars! We're committed to adding a bit of hygge into our every day! If you are too, you're going to definitely want to pick up this book, and this one too. While you're at it, you're probably going to need this candle (or this one) and probably add to your sock collection! Our friend Denise with Love Ding also shares all about hygge on her blog here where you can find even more downloadable and has a very hygge inspired DIY we cannot wait to try! Want a daily reminder of hygge? Check out our favorites from our collaboration with Love Ding for downloadable desktop and phone background pattern play inspired by all things cozy! Can you believe 2017 is coming to a close? We hosted our last Small Business School #IRL panel in the studio at the end of November, focusing on the small business lifestyle and what it means to support small businesses. We had an amazing line-up of panelists who all owned their own businesses right here in Austin- April Onebane with Pieceology Vintage, Ashely Chinni with Ash Grove Studio and Celeste King with Catapult Creative Logistics, moderated by Chelsea Francis with Chelsea Laine Francis. It was the perfect mix of product based + service based businesses. Although the holiday season is important for most businesses, we wanted to really dive into the conversation of how to truly shop small and local year round. How many times have you heard of someone saying that their favorite local coffee shop, or mom & pop bakery closed? It's more important now than ever to really put your money where it can have the biggest impact right here in your community. With the ease and immediate turn around of free, even same day deliveries, it's difficult for a small local business to compete. Mass production allows big box shops to offer much lower priced items than artisans who hand make all their wares. Shopping small doesn't need to just be for the holidays or for special occasions either. Small businesses depend on folks who intentionally shop local and loyal customers all year long! Check out what our panelists had to say below. When you shop small, your dollar goes much farther. It goes into supporting the business owner's livelihood, it goes towards them growing their business, reinvesting in their business, adding value into this community. It trickles down from the actual product or service you purchased and makes such a huge impact! Shopping small and local definitely costs more, and perhaps you're not able to gift presents in large quantities but it can be more meaningful and personal. Will you be shopping small and local this holiday season? What about throughout the year? Have any great local businesses you think we should know about! Let us know in the comments below! As a small business creative and founder of The Paper + Craft Pantry, Pei Sim is not stranger to how productivity and workflow can correlate to how organized your space feels. For those of you who follow us or who have been into our business, you know we operate as a retail shop + workshop event studio. And most of you can guess that even when we aren't open, there's a lot of work that goes on behind the scenes to run a growing business. This month, we're taking a peek into Pei's home office and studio and chatted with her about how she stays on top of everything she juggles for The Paper + Craft Pantry by setting herself up for success with her personal work space. 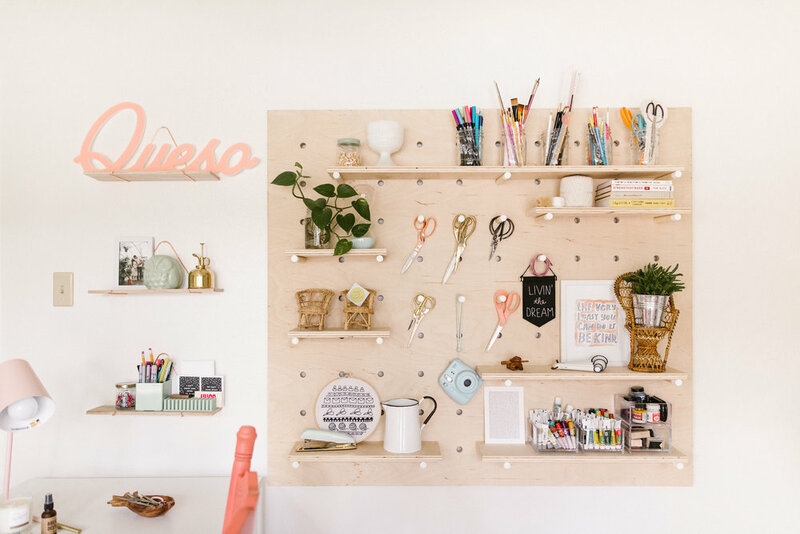 Recently she enlisted the help of her dear friend, Denise Roberts, owner of Love Ding to help her up the game of her home office + studio in an adorable and functional way that inspire and motivate her to get through the daily to-dos. Keep reading for Pei's tips on which organization tricks keep her most productive when she's working from home! One of the first things we noticed when we stepped inside Pei's office was the abundance of natural light. We know that natural lighting may not be always an option for everyone, so one of Pei's suggestion is to switch out your lightbulbs for a natural bulb. Making this small change to your ceiling fan or lamp can switch your mood and put you in the mindset to get to work! Pei also keeps her desk space fairly clean and minimal; her laptop + notebook beside a desk lamp, lavender mist, candle, and a few little things she uses regularly. This really leaves room for her to spread out projects and work on a larger surface. If you don't have access to natural light, swap out your light bulb for a daylight bulb! Poppin trays from The Container Store come in an array of colors **bonus: they stack and can be configured to fit almost any drawer! Head to the kitchen section of Target and pick up utensil drawer dividers, which are often nicer than the plastic desk drawer dividers. 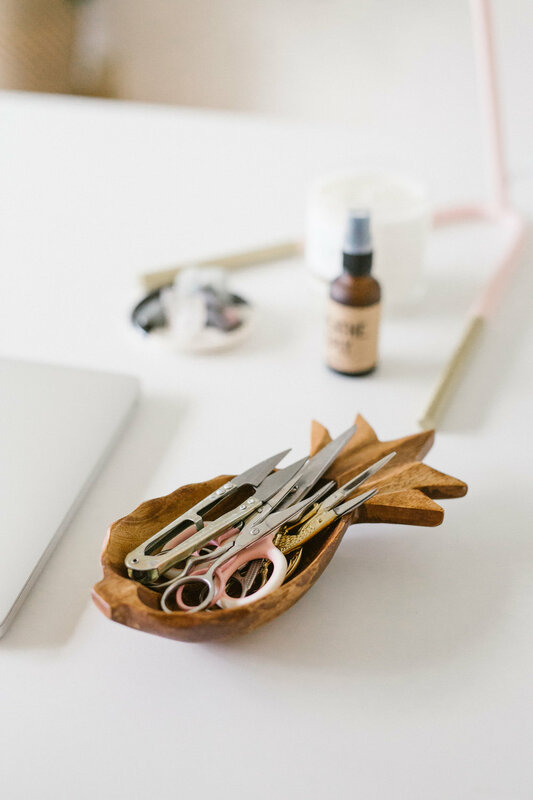 Take a moment to look through what jars, boxes or trays you might already have lying around and repurpose them for your workspace. Besides tucking things away in drawers, Pei now uses the giant pegboard wall installation that Denise designed for her space as a part of the office + studio Spruce Kit. It makes a huge statement in the space. And because of this beautiful handcrafted piece, Pei is able to display her craft supplies and tools while keeping them all readily accessible! The pegs in the board can also be moved and reconfigured to suit what she currently uses and what she needs. To keep things visible yet neat, she uses clear glass and acrylic containers to corral paintbrushes, markers, paints and inks on top of wooden shelves. Several pegs were also left empty to hang her ever growing scissor collection, which now features some of her favorite pairs! No room for a big pegboard? Floating wall shelves are a great alternative! Take your time to try out a set-up, and don't be afraid to switch things up to make everything truly functional for your needs!